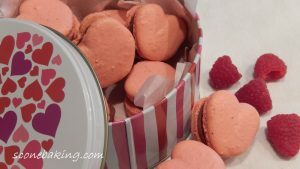 I have made this YouTube video to demontrate how to make my Heart-Shaped Raspberry Macarons, which are a treat on Valentine’s Day or any day. They are crispy on the outside while being chewy and soft in the inside, with a chocolate ganache filling and a raspberry jam surprise in the middle. These are soooo delicious. If I can make these, so can you. If you like this video, please give it a “thumbs up” and subscribe to my channel “Scone Baking and Beyond” on YouTube.